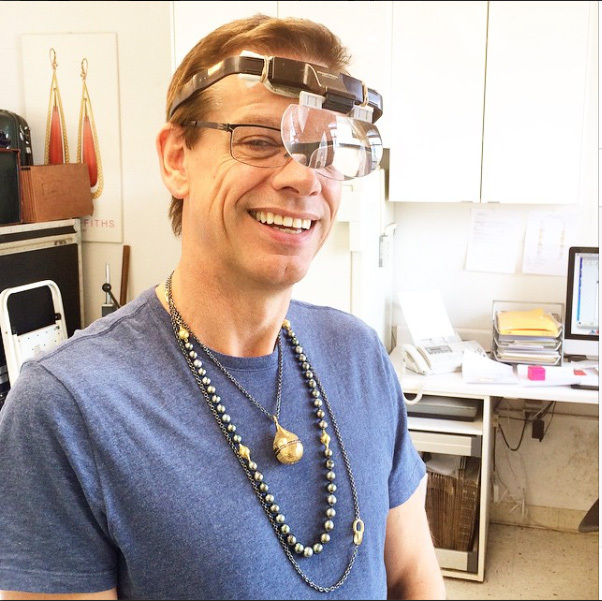 When you first see Ray Griffiths' work, you might be tempted to think that he's some stodgy old master jeweler. Because, honestly, the attention to detail is incredible, the craftsmanship is sublime and the overall vibe is one of divine elegance. But dig a little deeper and you'll quickly find the playful touches of a contemporary artist – a duality that we absolutely love. Plus, who can resist that smile? Read on to find out why we are head over heels for this Aussie who now calls the Big Apple home. 18ct Yellow Gold crownwork Regency ring with bezel set Pink Spinal (10cts) and pave white diamond (.50cts) and pink sapphire (1.85cts) surround set in oxidized silver. 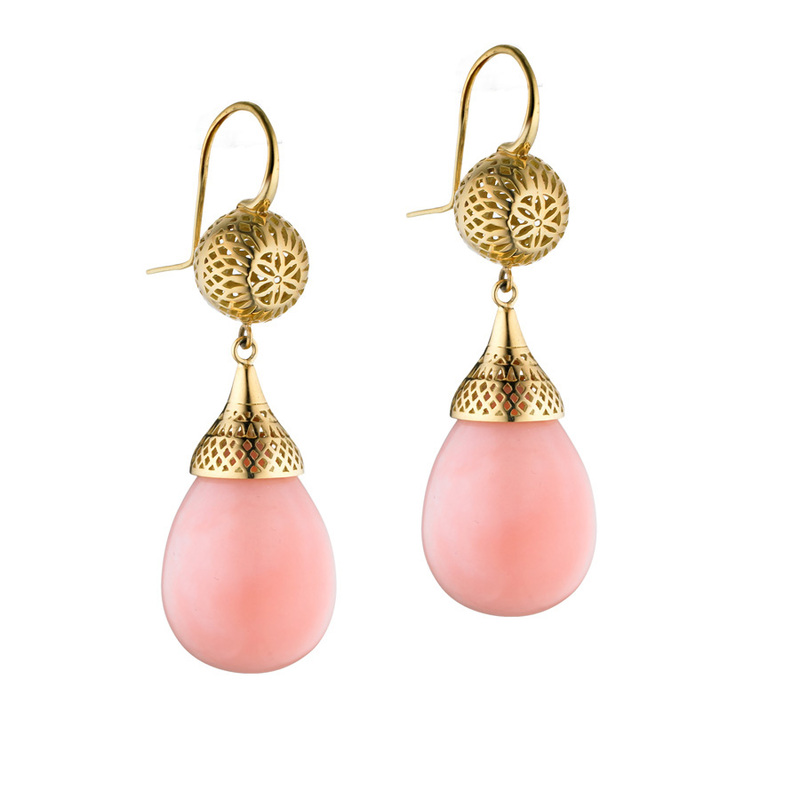 18k Yellow Gold crownwork ball drop earrings with pink Peruvian opals on tapered hooks. 18kt yellow gold crownwork half finials set on oxidized chain with multi-strand crysophrase beads and Medium and Small Crysophrase bead necklaces set with 18kt yellow gold crownwork graduated finials. 18k Yellow Gold crownwork conch shell bracelet with diamond set bale. 18kt Yellow Gold graduated crownwork square necklace with diamond accents (0.75cts). Opal ring in 18k yellow gold with diamonds. Ray in his favorite place in the world – at the bench. 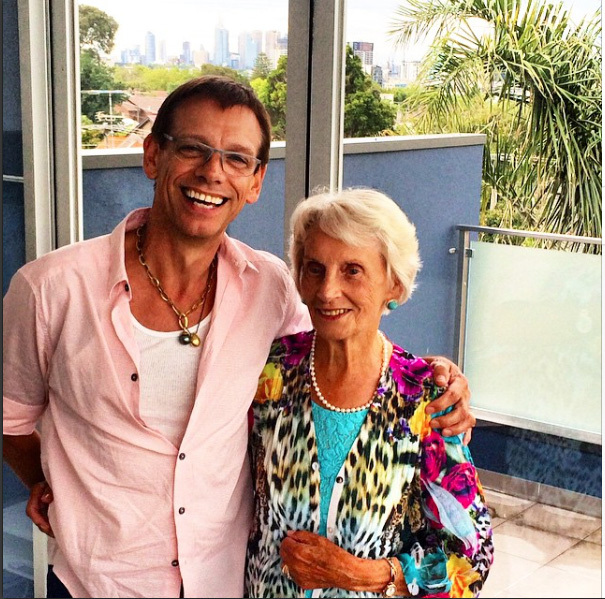 With his beloved mother at home in Australia. On a recent trip to Israel at the top of the Madada. Blast from the past – Vogue Australia ad for Ray’s old store Rox Gems and Jewellery. Bacaro on Division street in the Lower East Side, I sit at the bar with my vodka martini and I have the beef casserole on soft Italian polenta and an Arugula salad. I would love one of of Victor Veylan’s Buffalo horn rings. Australia – it’s home to me but also one of the greatest vacation spots in the world. You simply cannot beat Sydney in summer. I am more of a newspaper man. And I love an old school physical copy of the Sunday New York Times that I read cover to cover, can’t put that down. Vodka martini straight up with 2 olives please. Opals. I suffered “opal trauma” for most of my career and I think I am finally over it. When I was first starting out, in the first month of my apprenticeship, I dropped an opal and it shattered to pieces. I never quite got over it and have always avoided them. In the past year I just fell in love with too many opals and have slowly been introducing them into my collection. My Regency rings – so classical. The bones of the style is a beautiful classical masterpiece, but it can be manipulated in so many ways to be very modern and I am just having the best time playing with them. I run a mile and quarter on treadmill and then do a 15-20 minute set with 15 pound weights, high reps to keep up the cardio and low weights on my abs and back. I swapped some old English coins when I was 8 for a pocket watch from the 1780s with verge movement. I still own it and it’s still in perfect working condition. Quality and solid workmanship will never fail (it’s something I strive to always bring to my own pieces). Salvador & Gala Dali, they were crazy (the best kind of crazy) and it would be the most amazing experience. They were a very social and fun couple and their brains work just differently. Love them! My grandfather’s wedding ring, my mother gave it to me when I was a little boy to put on my left hand. I am very dyslexic and when I was young telling my left from right could be challenging. So, I had my grandfathers ring on my left hand so I would always know which way to go. My feet – I would walk everywhere if I could. Curtis Mayfield, Nina Simone, Everything But The Girl, Ella Fitzgerald, Ashford & Simpson. I would serve polenta with a chicken and vegetable casserole. It’s a big meal and can serve lots of people. When I cook I like to use lots of fresh herbs and spices. I am a technophobe – it would be my phone because I am used to it. Alexander McQueen in his heyday, I love his clothes and his vision. The shows were a performance and the clothes were the stars of the show. Face scrub and really great moisturizing cream – I use apricot face scrub every day and Shisedo moisturizer.